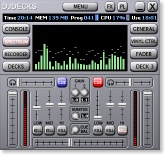 djDecks is computer mixing software for both beginning and professional dj's. Mix any audio or video file easily on any configuration. Atomix Productions and adionSoft merged and together developed Virtual DJ 8, bringing you the best of djDecks and Virtual DJ. Up to 4 full-featured decks are available for mixing, offering detailed waveforms, pitch ranges from 4% up to 100%, automatic bpm detection, looping, cue points and effects. The colored waveforms aid you in seeing what's coming up, and the accurate cue points and beat-aligned loops will make your mixes easier. Pitch corrections are made inaudible by changing only the tempo but not the pitch, and even changing the position of a playing song sounds seamless because it's beat-aligned. djDecks can be used with an external mixer, sending each deck to a different output, or you can use the internal mixer which includes a three-band equalizer with adjustable frequencies, pre-listening options, and a limiter to ensure that your mix sounds clean all the time. The browser allows you to browse your songs by reading their tags. You can fully customize the columns that are shown, quickly search any track in your library, create playlists and even create rule-based smart playlists. It can also show your album-art next to the songs. djDecks is compatible with many midi controllers out of the box such as the Vestax VCI-100, Denon HC-4500, Hercules DJ Console, Numark Mixdeck, Pioneer CDJ-2000 and many others, but you can also create or customize your own mapping for your controller. MIDI, HID and OSC standards are supported to create your mappings. If you want to have the feeling of mixing with vinyl, yet have the advantages of digital files, then you'll definitely want to check out djDecks' Vinyl Control. Using special vinyls that contain a special code, your music will follow the exact speed and location of the needle on the control record. djDecks is compatible with most vinyls available such as Final Scratch, Serato Scratch Live, Traktor Scratch, Virtual DJ and MsPinky. It's also possible to mix regular vinyl or other inputs such as mics with djDecks, and also use beat detection and effects. You can even record a piece and start scratching it using vinyl control instantly. djDecks also supports recording your mix, or broadcasting it to a Shoutcast or Icecast server. A recent addition to djDecks with the new DX release is the ability to play Video and Karaoke files. The video mix can be shown on an external output, and various effects can be applied and transitions selected. Another strength of djDecks is the way in which it can be fully customized. You can create very advanced controller mappings, but also completely change the way djDecks looks by installing or creating custom skins, and add new functionality by creating your own scripts. djDecks is no longer for sale. Please get VirtualDJ 8 instead. There's also a documentation section where you can download the djDecks manual and find a lot of other resources for creating your own skins or using specific hardware in combination with djDecks.